"I'm feeling pretty under the weather right now," Sergio Pizzorno says as he enters his dressing room at New York's Terminal 5. 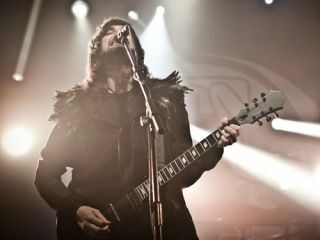 Truth be told, the Kasabian songwriter-guitarist does look a tad pale, and his jet-black rooster hair along with a matching rock-star wardrobe exaggerates his skin's lack of pigmentation. "It must have been the chicken wings last night," he says, disappearing into a black couch and heaving a full body sigh. "Gotta remember not to eat chicken wings at 1am ever again." Pizzorno is conserving his energy for soundcheck, due to commence in roughly 30 minutes, and the all-important show later on. Although Kasabian (which also includes singer Tom Meighan, bassist Chris Edwards, drummer Ian Matthews and guitarist Jay Mehler) are superstars in their British homeland, packing arenas and headlining festivals (they're toplining Reading, Leeds and T In The Park this summer), in the States they're playing considerably smaller venues. The band haven't toured the US since 2007 (they were scheduled for a 2009 run, but had to cancel at the last minute when Meighan was quarantined with swine flu) - a lifetime in ADD world of pop music. Even so, Pizzorno insists that the band aren't changing their set or tailoring their act for fresh eyes and ears. "We're not doing anything different at all," he says. "There's no tricks or anything like that. We've always just played." Which means that the band will offer up a healthy amount of their latest album, the sonically voluptuous Velociraptor!, along with hits such as Vlad The Impaler, Shoot The Runner, Where Did All The Love Go? and Underdog. Despite his queasy stomach, Pizzorno proved to be engaging and entertaining during our conversation in which we talked about the new album, songwriting, guitars and whether he considered himself a Beatles or a Stones man. Some artists like to write on tour. Do you find that life on the road inspires songs? "Yes, but in a different sort of way. I tend to gather information, like I'm hoarding it. Doing that, I find that I can work out in my head what the next record can be or what I think I'm going to do next. It's not necessarily writing, but more getting my head together and hearing sounds and figuring out what I want. "Being on tour, it's hard to really write - I think. But I buy a lot of books and films and music, and I try to absorb it all. That's the only way to get through the whole thing." When playing smaller venues here in the States, do you feel a different kind of pressure than when you play arenas in the UK and elsewhere? "No. It's great. I love it, in fact. I've missed playing this size of venue. I think we're lucky because we get to play the huge gigs, and then we get to come back here and play these places. Just looking at that stage, I'm ready. These shows are a lot of fun. I love everything about them." Let's talk about some of the songs on Velociraptor! Switchblade Smiles is that marriage of electronic beats and straight-up rock that you seem to like. Which riff came first, the electronic one or grungy guitar? "It shouldn't have worked, but it did. It was like a collage, really. It was like picking stuff up from all over the place." You didn't smash any of your Rickenbackers in the video, huh? "No, not at all! [laughs] That was like a cheat. It was this cheap Gibson or something. I don't even think it was a real guitar; it was sort of done up for the video." Goodbye Kiss is a great melodic pop song. There's a bit of Roy Orbison influence in there, but some Smiths, too. "Yeah, yeah. I think there could be some Smiths. It's a bit of a traditional Roy Orbison or Phil Spector thing, maybe even some John Lennon - those people. I listen to everything. I'm obsessed with music, and I draw on all sorts of things when I write. "I don't have any kind of 'cool monitor.' If something isn't cool but I like the sound of it, if it makes my hair stand up on end, I'll give it a go, you know what I mean?" Does the actual sound of a guitar ever inspire a song? "Most of the songs I write are on an old Hofner - I think it's from 1953. I love that guitar; it's like an old pirate ship: it's ornate, it's beautiful, and all my writing gets done on that, basically." You mentioned Immigrant Song as a reference for Days Are Forgotten. You worked with a vocal loop for the writing. Do you do that a lot? "All the time. I produce as I go along with the writing. I think of myself as much a producer as I am a songwriter. I don't necessarily follow the traditional lines of songwriting in that I write a song on acoustic and take it in. "The songs I write sound the way they do because I'll write to the loop, I'll write to the beat. The loop, the beat inspires me to come up with a melody. So yeah, I'm just as much a producer as I am a songwriter." A couple of years ago, the riff for Underdog was chosen by the readers of Total Guitar as one of the 50 best of the last decade. Good choice? "Wow! Did it really? That's huge… I never knew that. [laughs] That's such an honor. I love that riff. To me, what's cool about it is that it was done on a Hofner guitar, an acoustic - that's kind of the least heavy-riff, rock 'n' roll guitar you could imagine. Wow, that's pretty amazing." One doesn't get the feeling that you sit around working on guitar scales. But do you practice at all, or is your approach to the guitar more about writing? "My whole thing is, I'm a rhythm player. I love picking holes into tunes. Riffs and rhythms - that's what I'm good at. I look at Jimi Hendrix, and I just can't get my head around that. He's such a special guitar player. I could try all my life to play like that, and I'd never get there. "You have to look at what you're good at and what comes naturally. For me, it's like I said, picking at the holes and making interesting rhythms. African rhythms and black rhythms - that's where I sit. You know, I've always been able to find a pocket in that kind of playing. So, that's where I'm at in terms of guitar." Since Christopher Karloff left, you've been the main songwriter for the band. Has that made things easier for you? "It's kind of always been that way since day one, so nothing's really changed for me. Nothing's really different." In some ways, you and Tom can be viewed as being something of a modern-day Townshend and Daltrey. Do you see that comparison? "Yeah, we get that quite a lot. I'd say that's a very good comparison - bang-on, really. We're not really like them, you know, as far as our bands are concerned. I do write with Tom in mind, because he's got a very different way of delivering a song than I would. It's always in my mind that Tom has to sing it, so it's a consideration for every point." What kind of demos do you make? Are they elaborate, with all the instruments and vocals plotted out? "As I said, I kind of produce as I go along. Everything sort of forms at the same time - it's pretty amazing. As for the ideal way of recording at home, I tend to use whatever's lying around. I'll be like, 'That sounds great,' and I'll press record. Simple as that. "I like to use old synths, old amps. Anything that just looks old, that's what I've got in my studio. There's no kind of technique behind what I do - I just kind of go, 'Let's work until this sounds good, however long that may be.' Whether the mics are hanging from the ceiling or facing the wrong way, if I like the sound of something, it's in." How do you record your demos? "I record with Cubase, and I also use Pro Tools. But as I said, I don't really demo. It's more like you're making a painting, and it takes you four months to fill it all in - that's kind of how it is. That's why a lot of the songs have these insane middle sections or all of these twists. I'm throwing paint on them, and then if something's not right, I'll move something out or put something else back in." On the past two albums, you've worked with Dan The Automator. What does he bring to your music? "I think what Dan's good at is taking what I record on a 50p microphone and making it sound like it was done in a real studio. He can take a Hofner guitar that I recorded, and he'll beef it up till it's huge - that's great. "I never needed help shaping the tunes or anything like that. I think the Kasabian sound is what I've developed over the years, so I've never needed any help with that. I've always had a very strong identity, and I've always known exactly what I wanted." The guitars you use - Rickenbacker 480s and 481s, Fender Coronados, Epiphone Casinos - are all older models. You don't like new designs? "No, I don't like new guitars. They look horrendous. There's no story to them. I like imagining who else might have played a guitar, you know what I mean? Guitars are such beautiful things, and old guitars… I think of all the people that dedicated their lives learning how to play them, all the tunes that were written on them. Incredible stories come with old guitars. I like the way they look, the chips in them - they're more fun." With the exception of the Rickenbacker 480 models, you favor a lot of semi-hollow guitars. What is your ultimate guitar and amp combination, the one you gravitate towards most often? "A Watkins amplifier and a Rickenbacker SF - side-fretted from 1975 [Editor's note: model 481 with slanted frets]. It's just the baddest sound. It's my sound - nobody else really uses it." OK, last question: The Beatles or The Stones, and why? "Now, I'm going to cheat, because I'd want to have The Beatles' songs, but I'd rather have been in The Stones. The Beatles' songs, as we all know… well, there's nothing more to say. But being in The Stones always seemed to be a lot more fun. Live, the Stones just did it year after year; they'd groove and they were loose. They always looked so cool, too. "Keith is my favorite guitarist of all time. I know a lot of people feel the same way, but his philosophy on life, the way he is… he's incredible. As a player, at his core, he's a real musician, someone who just loves music. I think that's beautiful."